“In our world, the data hole is this strange mix between a black hole where everything gets sucked in and nothing can escape and the rabbit hole that Alice gets lost in.” As director of data science for New Jersey-based Holy Name Medical Center, Emma Yamada speaks with a veteran’s respect of a phenomenon she encounters on a daily basis. Yamada has endeavored to keep a recently united analytics team on the same page, both by embracing data’s potential and avoiding the unnecessary. 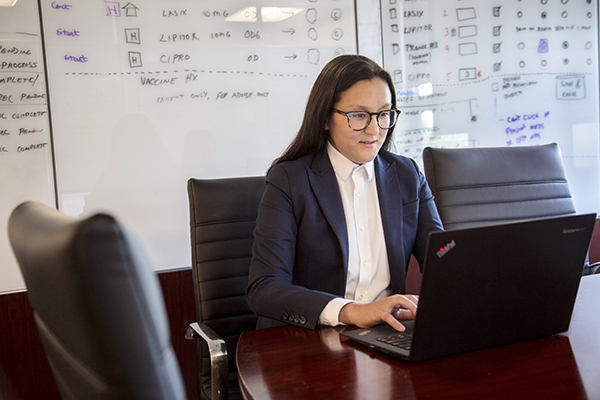 She and her team are helping Holy Name get better data faster and ushering in exciting opportunities for artificial intelligence and machine learning. The recent creation of the research and development team places Yamada and her team at the tip of the spear when it comes to potential innovation using new technologies. “We look at leveraging artificial intelligence and machine learning to support clinical decision-making,” Yamada says. “Can we make predictions that help our providers make better decisions faster?” She certainly thinks so. Yamada says the influx of monitoring devices such as Fitbits and Apple Watches offer a virtually untapped array of valuable data that could be used by health systems. For Yamada’s team, it comes down to working to prevent both high-cost and high-risk problems. Using predictive data to manage Holy Name’s ACOs has been a high point of success for the research and development team. By focusing on specific patient indicators, Yamada’s team has been able to successfully manage a patient-doctor population ratio of four thousand to one. “Everyone can see who they need to see, get where they need to be in terms of their health, and it’s not going to burn out the care team,” Yamada says. Alteryx, DataRobot, and Tableau have also been essential for the analytics team to pare down to the essentials to sift through endless data sets. “From a strategic standpoint, we think of every data project similar to writing a book report,” Yamada says. That means constructing an initial outline that helps prevent grabbing unnecessary data irrelevant to the project. Yamada says the key to improving Holy Name’s analytics processes is the final step of successful data delivery. “How do I make it better even if they didn’t ask for it?” Yamada asks. The focus on evolution and improvement might explain Yamada’s rise and why Holy Name Medical Center’s data science team won’t be losing any numbers down the data hole.